If, in many people’s minds, Yorkshire has never been at the very forefront of prog, it still has a mighty heritage. Keith Emerson was born there, Rolo Tomassi emerged out of Sheffield in the noughties, and that’s before you even mention Mostly Autumn, The Tangent, and Guy Manning. Guisborough-based outfit The Pipe Brothers are – with a mix of northern grit and prog virtuosity – in the process of adding to the Tyke legend. Though still in their twenties, Andrew and Jamie Pipe have already carved out a name for themselves with psychedelic blues outfit The Mentulls. Formed when the brothers were still in their early teens, the band have already drawn the attention of prog royalty in Martin Barre and ex-Camel and 10cc sticksman Paul Burgess. The Pipe Brothers Project is the next logical step. So far the Project have released a brace of appetising singles, featuring the likes of Paul Burgess on drums and Steve Amadeo on bass. Andrew says of Burgess’ drumming, “It’s really inspiring, not least because I’m a big 10cc fan.” After their first single reached the Top 10 Amazon bestsellers chart, and the latest Sonic Journey topped the new releases chart, the Pipes have worked on the follow-up. Single number three is due to drop imminently, again featuring Burgess on drums. Musically, the Pipe Brothers aim, as Andrew puts it, “to take inspiration from the prog of the 70s while bringing in the sophistication of Neal Morse and Toto”. A key factor to the richness of their sound is Andrew’s exceptional guitar virtuosity. “My biggest inspiration,” he says, “is Martin Barre. He inspired me to play the guitar.” But he also includes Andy Latimer, Andy Powell and Steve Lukather among his list of greats: “They’re all very musical players who fit in with the music.” The first couple of Pipe Brother offerings reflect this philosophy: in the midst of mind-burning riffing, both Andrew and Jamie seek to complement each other, bringing the rich melodies to the fore. If the Pipes are sufficiently well-respected to collaborate with big-name artists, they have real humility too. There is a delight in Andrew’s voice when he speaks of his respect for and friendship with the legendary Martin Barre. It’s fair to say he’s a life-long fan of the Tull legend. With laughter in his voice, Andrew says, “I met him at the side door of Tull gigs when I was a kid. I got his autograph.” Now, Andrew has had the privilege of playing with Barre onstage, at a gig in York. 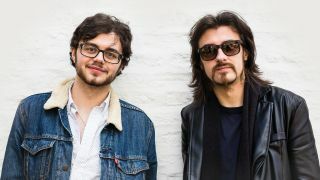 It’s vignettes like that suggest that though both Pipe brothers are still youthful – older brother Jamie is only 25 himself – there is more than enough talent, passion and, well, Yorkshire grit to make the Pipe Brothers Project as hard a hitter on the prog scene as the Mentulls have been on the blues scene. The Pipes plan to run both projects side-by-side, but it will be interesting to see where the momentum builds in the long-run. As he reflects on clocking up 10 years in music already, Andrew shows plenty of wisdom. “When we’re writing music we’re careful not to be too pigeon-holed. Prog is a mix of folk, classical and blues.” He adds, however, that, “What’s really important to us as writers is to keep taking that music we love into the present-day. You have to respect the past, but put it in a modern context.” The Pipes already possess a wealth of experience and they’re young enough to take prog into the mid-century and beyond. It’ll be exciting to see where they go.